Unearth the legends of St. Louis Cemetery No. 1, the oldest standing cemetery in New Orleans. Explore the "City of the Dead", wall vaults, family and society tombs. Pay your respects to our voodoo queen, Marie Laveau, and other notable heroes and villains at their final resting place. Hear tales of deadly yellow fever epidemics and other hardships and daily life of early French Settlers. Visit Congo Square, the site of voodoo ceremonies and musical history. Visit the house where voodoo Queen Marie LaVeau lived. Walk through Congo Square, the exact site where voodoo ceremonies were held on Sundays. See the Mortuary Chapel, last stop for tens of thousands of Creoles. Learn how voodoo is practiced today in this superstitious city. All of this in and more in a 2 hour walking tour. Entertaining presentation, historically accurate, five star guides. Meet at 622 1/2 Pirates Alley, behind Cabildo Museum. Beginning at 1pm we host a lively two hour walking tour in footsteps of bygone Creole ladies and and gentlemen as they laid to rest their own forefathers. From there we will stroll through the French Quarter towards St. Louis Cemetery #1 - the oldest standing Cemetery in the City. We will share the history of Voodoo Queen Marie Laveau, and her legacy on our way to the Cemetery. We will share with you the story of her fabulous life and how many both loved and feared her. You will hear of the hardships of daily creole life and learn about the architecture of the city, now three hundred years old. You will visit Congo Square and learn how Jazz was invented on those hallowed grounds. We will stop for something cold to drink before we visit the tombs of the notorious and the destitute. We will visit the tombs of famous voodoo queen, Marie Laveau, actor, Nicholas Cage, bankrupt financier, Bernard de Marigny, Creole activist, Homer Plessy and the family tomb of accused serial killer, Madame LaLaurie. After the Cemetery, we will take a brief break and we will continue to explore New Orleans three hundred year history and end back near Jackson Square. All this on a 2 hour narrated walking tour. 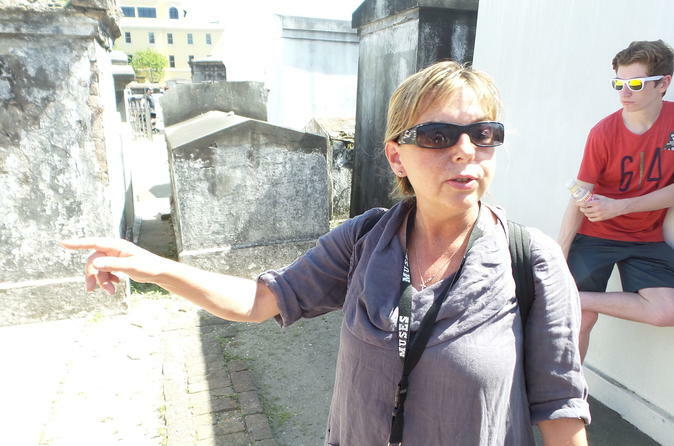 History of New Orleans, Voodoo, Music and St. Louis Cemetery #1.